Mail's Preferences enable you to greatly customize Apple Mail's default behavior's to fit your expectations and work process. Some of the Preferences naturally found their raison d'être in other parts of the Apple Mail tutorial. In each such case, a link will refer you to the appropriate page. For a discussion of the Accounts tab of Preferences, please see Email Account Settings. The Junk Mail tab of Preferences is covered under Spam & Junk Mail. Color quoted text allows you to color-code the thread levels in an email exchange, which can be quite practical to visually identify blocks of text instantly. 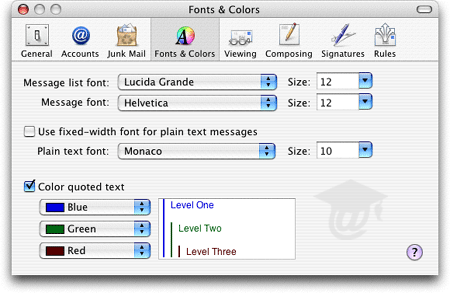 In the icon Apple Mail uses as an example, "Level Three" would represent your original, first email. Preferences' Viewing tab lets you determine the level of details provided in visible email headers: emails come with a long string of metadata (useful to mail servers, mostly not to humans), from which Apple Mail only displays the bare bones: sender, subject, and recipient(s) - (default). Related messages (emails part of a same exchange) can be optionally colored to visually link them as belonging to the same thread. 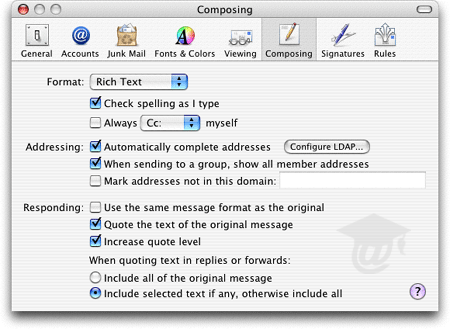 Preferences' Composing tab defines the default settings for outgoing emails. 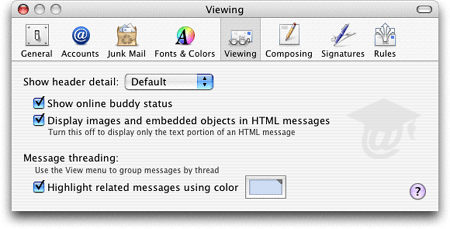 Most people's email clients use and support Rich Text editing (colors, text formatting, etc. ), therefore "Rich Text" as default is not only fine, but more appealing. Use the same message format as the original is a good idea, since the sender's blank emails give you an idea of his/her preferences in email formatting. Quote the text of the original message and Increase quote level: indents each email reply -within limits- so that it is visually easy to identify to whom belong a block of text; it is helpful, especially when trying to retrace a conversation in a long exchange. Include selected text if any, otherwise include all allows you to include selective pieces of threads in your replies or email forwards: clever and useful. To create and manage email signatures in Apple Mail, please refer to the Email Signature tutorial. For a discussion of Apple Mail's Rules, please see the Rules with Apple Mail tutorial.